PLOG - The PNLIT Blog: Ducklings! 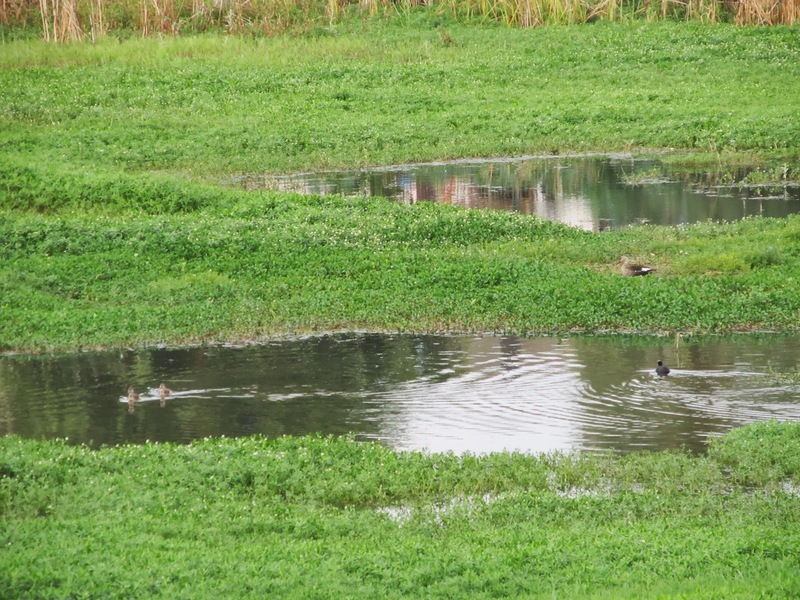 It has been just over a month (after the first heavy rains in May) since we noticed several birds, including a pair of Indian Spot-billed ducks (Anas poecilorhyncha), back at Puttenahalli Lake. The Spot-billed Duck likes freshwater lakes and marshes. It feeds by dabbling in shallow waters and marshland, mainly on plant food like seeds, grasses and aquatic vegetation. It also looks for aquatic insects and their larvae, snails and other molluscs, worms and other small creatures. The ducks must have been waiting to lay their eggs! With an incubation period of about four weeks, the ducks did not lose any time. "PNLIT now grandparents! ", said Usha as she spotted two little ducklings on 25th June. And despite being under the watchful eyes of the adults, one of the Coots was chasing them! .